One really shouldn’t visit this area without getting a feel for the Camargue itself and to see some of the things for which it is noted. 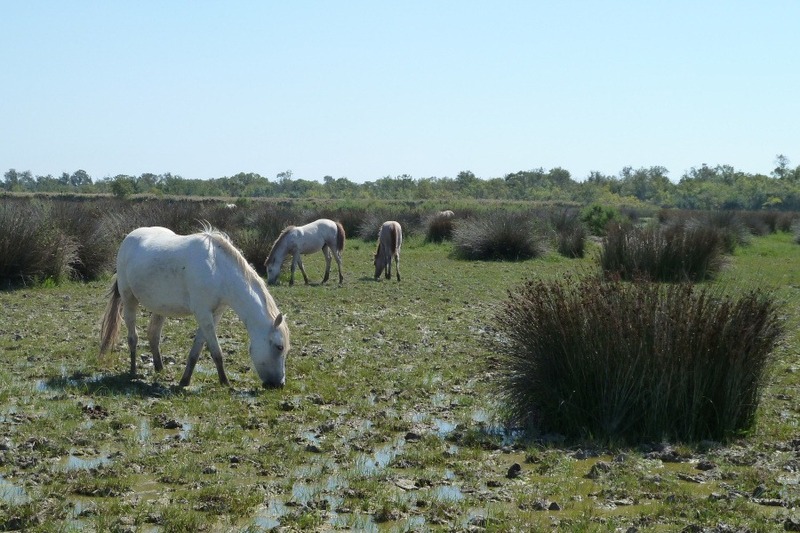 The Camargue is a large wetland formed by the complex and widespread delta of the river Rhône. 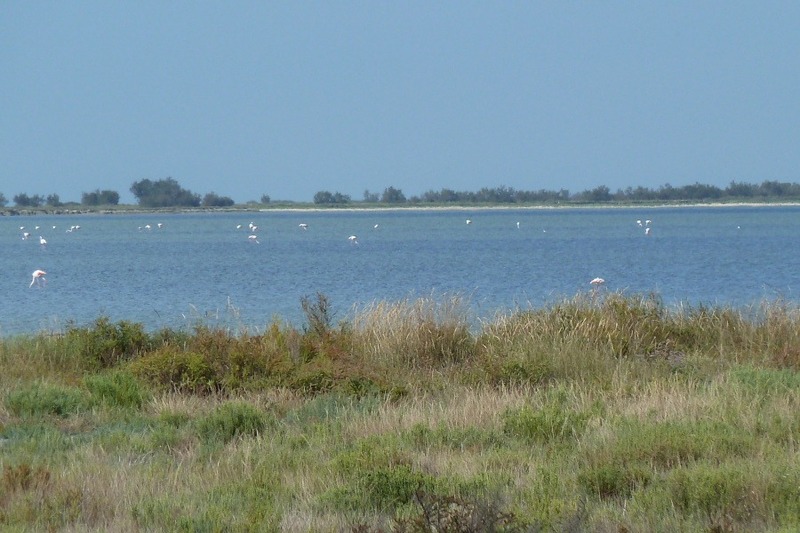 The largest water body within the area, sandwiched between the Petit Rhone to the west and the Grand Rhône to the east, is the Étang de Vaccarès where we began our search for one of the Camargue’s more colourful inhabitants, flamingos. This lake is large (6,500 hectares) and is apparently the winter home to 80,000 ducks and 60,000 coots – but no flamingos, it seemed. We eventually found the elusive pinkish critters in the smaller Étang du Fournelet. Distant though they are, here’s a spot of photographic evidence. Our plan was to finish our day with a visit to the Marais de Vigueirat, a wildlife sanctuary including, of course, Odos. 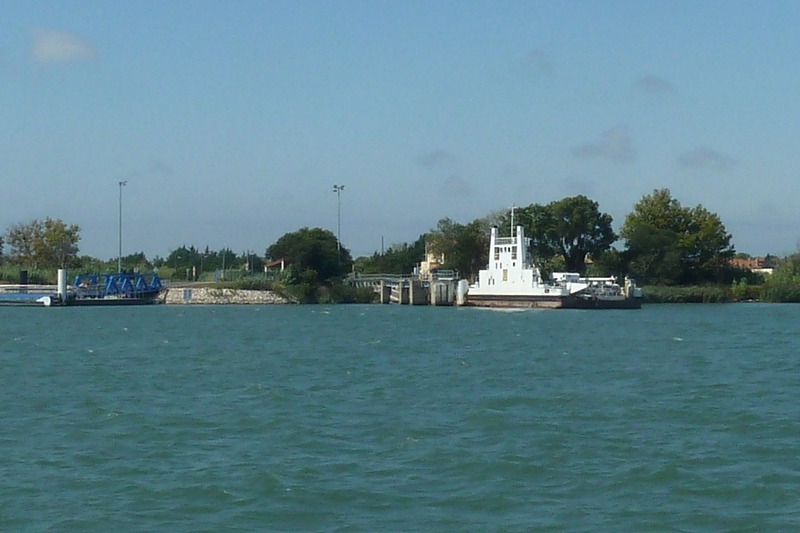 Since we were now on the wrong side of the Grand Rhône, we opted for a short ferry crossing on the Bac de Bacarin, very efficient, good fun. Paying the French ferryman the €5 for the crossing caused a laugh as I had to call Francine back for the cash; he reacted to that with suitable amusement. Enjoyable ferry ride over we arrived at the wildlife sanctuary where the reception was, of course, closed for lunch until 2:30 PM. How very French. Nonetheless, we seemed to be able to get in and wander around the public access paths (there are also private areas) to our hearts’ content. Our hearts’ content soon expired as we found no shortage of one the Camargue’s other famous inhabitants, the mosquito. Francine felt she was being eaten alive and we soon tired of spotting dragonflies which, as it turned out, didn’t seem that exciting after all. 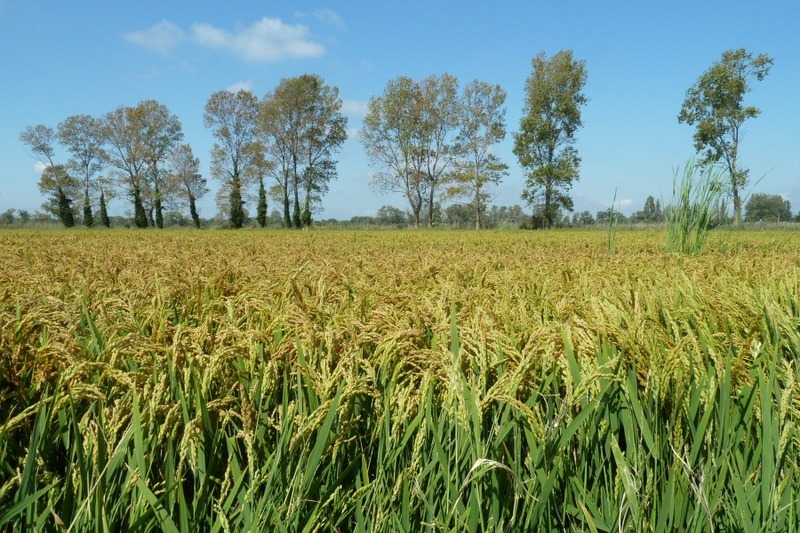 The Marais de Vigueirat would be very interesting, I’m sure, if you could pause long enough to study it with out getting bitten. The golden rule, however, seemed to be: keep walking briskly to provide the mosquitoes a more difficult moving target. We did, at least, have an opportunity to grab a few swift shots of another of the Camargue’s celebrities, the white horses. As an Odonata nutter, I would not bother with the Marais de Vigueirat again, even if I’d had a bath in Autan (mosquito repellent); it was quite a relief to get out of it. The rest of the day was fun, though.